Dallas Personal Training | Fit180 Private Training Studio in Dallas | Make a complete turnaround! At Fit180 Personal Training, our deep knowledge, background, and expertise are what sets us apart from the rest than the other Dallas Personal Trainers! We have a combined over 80 plus years experience with getting clients’ results! We have a combined over 30 certifications related to health and fitness! Not to mention the multiple undergrads and graduate degrees under our belts! We pride ourselves in the fact that we have been getting results and changing the lives of many over the past 12 years! Let’s just say our program and staff has been refined and we can guarantee results! Have a question or want to get started? Please contact us! At Fit180 Personal Training, we currently have three locations in the most convenient areas of Dallas! Our Lovers and Inwood location which is a straight shot off tollway from Downtown Dallas serves the communities of University Park, Highland Park, Greenway Parks, Park Cities, and Devonshire. Our Greenville and University location serves the East Dallas communities of Lakewood, M Streets, SMU, Lake Highlands, White Rock, and Uptown. Our Far North Dallas location off of Preston and Forest serves the communities of Preston Hollow, Lake Highlands, and North Dallas surrounding cities. We basically have you covered! You are able to train at any location if you are a Fit180 client along with a staff of over 15 highly skilled professionals, you will have no more excuses! Whatever your fitness goals – to lose fat, tone or build muscle, improve overall health, increase flexibility, attain core strength, and/or eat healthier, Fit180 will formulate a customized, successful fitness program that will yield results. Let us be your partner in helping you sustain a healthy lifestyle. 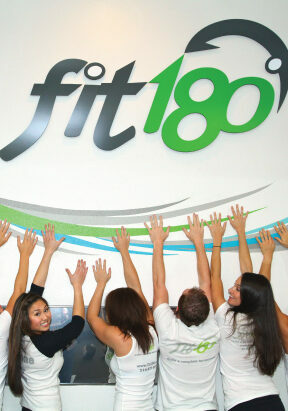 There are many reasons why so many people choose Fit180 Private Training Studios! The common characteristics I have noticed in our clients: They are smart, successful, busy, and love to learn and learn from the best! They strive to be more efficient with their time, money, and efforts. Our clients want results and they want sustainable results! Fit180 is the right place for you if you are wanting to get tight and toned for a wedding or wanting to get fit and lose weight post-baby or need a bathing suit body for that beach vacation… basically just lose fat and gain muscle, or just want a day to day healthy energized lifestyle. We will go above and beyond to help you get to your goals no matter how busy you are! We will find a way! We are your partner in this journey and here to support you even when life throws you those curveballs and tries to get you off track…we will know how to catch those curves balls and keep you on track or help get you back on track! We have been serving up happy, healthy, fit people for over a decade now! We thank you for trusting us with that responsibility and we take it very seriously!